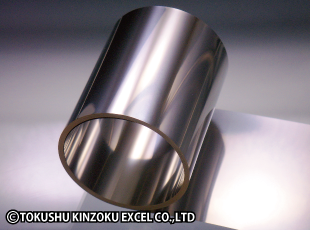 High Carbon Steel & Stainless Steels for Blades (TE-2, SK4, SK5, RB-S, SUS420J2) | TOKUSHU KINZOKU EXCEL CO.,LTD. These steels are suited for use in blades such as razors and utility knives, and can acquire high hardness when quenched. Produced using our rolling and heat treatment technologies, by finely controlling carbon grain size, they are materials with excellent hardenability, wear resistance, and sharpenability. Features of each grade are described below. TE-2 is an improved version of SK2 (SK120) grade carbon tool steel. It features increased hardenability due to adjustment of chemical composition and careful management of manufacturing history. Refined carbides provide improved sharpness and wear resistance. SK4 and SK5 are classified as carbon tool steels. They are used in a wide range of fields due to their workability, hardenability, price, and other features. 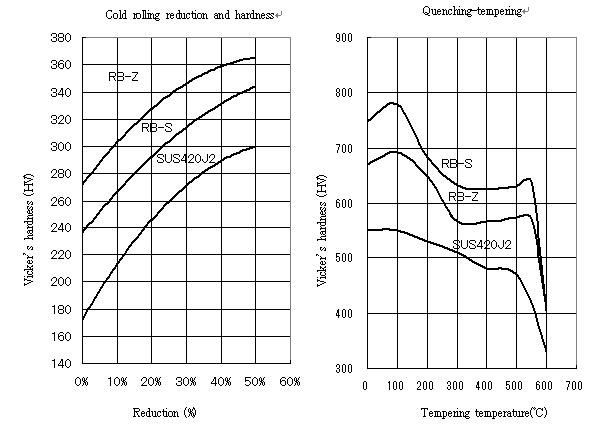 RB-S is classified as a martensitic stainless steel. It has a higher carbon content than SUS420J2, giving it good quench hardening properties. RB-S provides one of the highest levels of hardness of any stainless steel, and is used for blades and other applications. It is quite hard even with an annealed finish, which makes it unsuitable for complex processing, but ideal for blade applications. RB-Z is classified as a martensitic stainless steel. It has a higher chrome content than RB-S, and contains added nickel and molybdenum. Due to a somewhat lower carbon content than RB-S, RB-Z is not quite as hard after quenching, but the addition of chromium, nickel, and molybdenum give it excellent corrosion resistance. Other manufacturers typically accept custom-made orders in one-ton lots, but we are able to provide small lots starting from 300 kg. 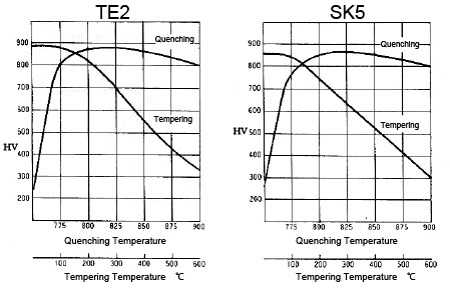 Quenching and tempering properties chart. Introducing quenchable martensitic stainless steels, SUS420J2, RB-S, and RB-Z.